How interesting that Mark says the Spirit "drove" Jesus into the wilderness for the express purpose of experiencing full-on temptation. One gets the sense that this was a necessary and inevitable part of Jesus' ministry. Let's do a brief study of passages that link Jesus with temptation to see if they have something to teach us about the role of temptation in our own lives. Perhaps we too should view temptations that come to us as positive tests—opportunities to resist Satan and prove to him and ourselves where we stand. In Matthew 16:23 Jesus rebukes Peter when he says, "This shall not happen to You" (referring to the suffering and death that Jesus has just predicted for Himself - Matthew 16:21). Jesus actually calls His friend "Satan"! Similarly, we need to be aware that those close to us—family members, friends, colleagues—may inadvertently be the mouthpiece of temptation. In the same way our resistance to temptation, or quick repentance and confession when we do sin, means that Satan will find no basis of accusation in us, no way to shut us up because he has something to throw back in our faces (as in 'You hypocrite—what makes you think you can speak against this sin when you do it yourself?'). His temptation along all the lines we are tempted (Hebrews 4:15) means that He, through His Spirit, can come to our aid (Hebrews 2;18) even suggesting the way out of temptation (1 Corinthians 10:13). Jesus' use of Scripture during His temptation in the wilderness is one tactic that readily comes to mind. How wonderful that God had temptation in the plan for Jesus' life. Let's regard it as a necessary and strengthening aspect of our life on earth as God prepares us for our destiny with Him. PRAYER: Dear God, help me to understand that temptation is not sin. 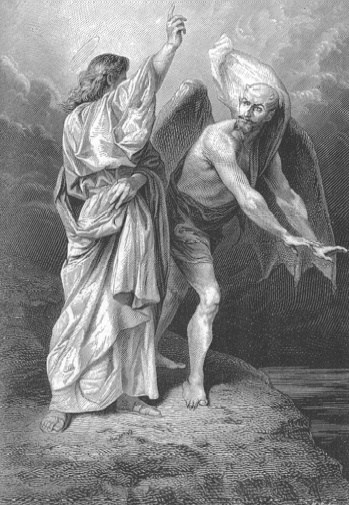 Help me to avail myself of Your Spirit's help when I am tempted, so Satan will have nothing in me. Amen. "Temptation is not something we may escape, it is essential to the full-orbed life of a man. Beware lest you think you are tempted as no one else is tempted; what you go through is the common inheritance of the race, not something no one ever went through before. God does not save us from temptations; He succours us in the midst of them (Hebrews 2:18)" - Oswald Chambers, My Utmost for His Highest, September 17th reading (emphasis added).